Its high time we stop using chemical ladened products & swtich to chemical free ones. We all know why. So i aint going to write that. 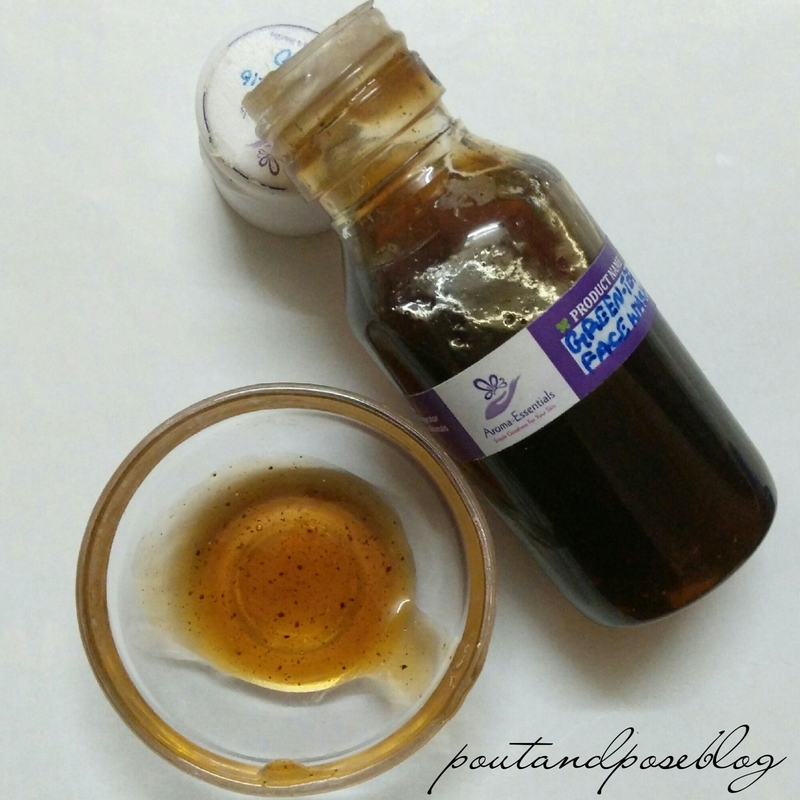 With this post i am introducing you guys to a brand called AROMA ESSENTIALS. They deal in natural & handmade skin and hair care products. They are based in Bangalore & established in the year 2009. At Aroma Essentials, they provide completely natural solutions for skin and hair care so you do not have to worry about any side effects. Their products are a combination of Aromatherapy and Botanical extracts. Their products are composed of natural essential and vegetable oils, natural butters and emollients that are safe to use and are non-comedogenic and non-irritant. This ensures that their products give your skin and hair a complete nourishing, refreshing and revitalizing experience. 13. Special and customised products such as Make-up remover, Hydrating mist, Belly butter, Body Pomades, Massage candles. 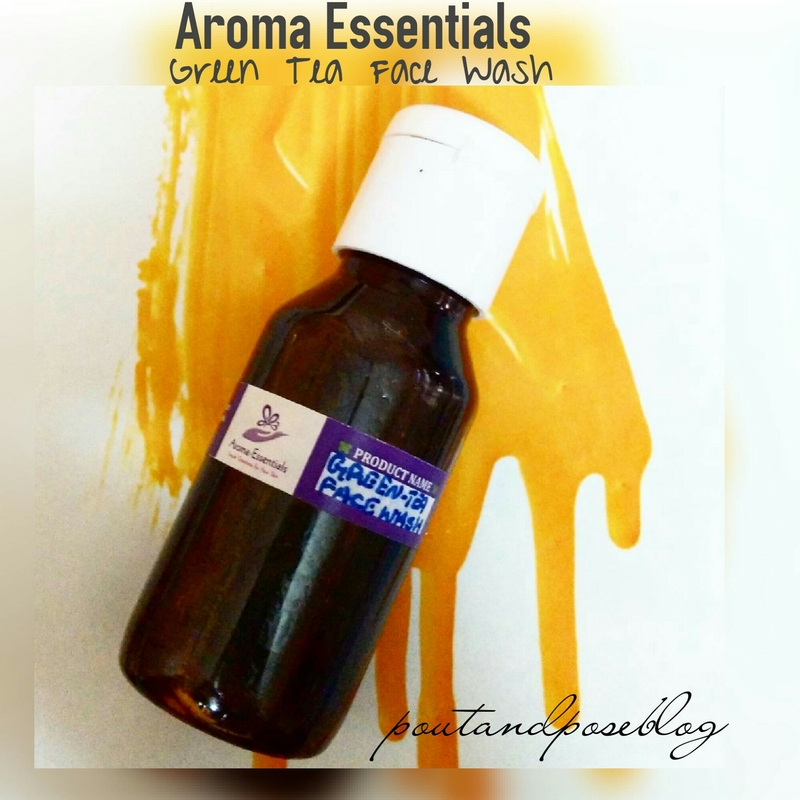 Last week i received few products from Aroma Essentials to be reviewed on my blog. One of them was Green Tea face wash and i am going to review it today. The face wash comes in a plastic bottle with a flip cap. It also has a stopper inside. The packaging is simple. It is priced at 150rs. Quantity wasnt mentioned on the bottle. Best before 6 months from mfg date. 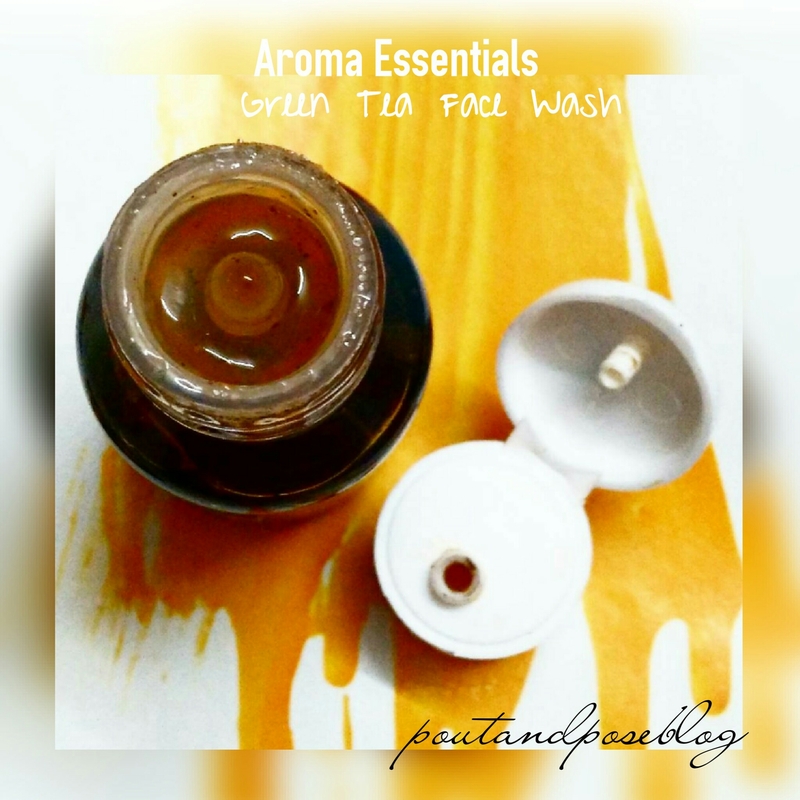 The facewash is Brown in colour and has gel like texture. My experience: I have acne prone skin & i am holding the right product in my hand.Green tea has some pretty cool acne clearing effects. It is one of the most natural ways to help skin appear brighter & flawless. I take a peanut size amount on my palm & massage it gently on my face in circular motions for about a minute. The face wash doesn’t forms lather which is kinda good actually. Because the more lather a product creates the more drying it is and vice versa. I felt a cooling sensation on my face while applying the face wash. After washing my face i can see my skin clean. It did not dry out or stretched out my skin. Its gentle and wont harm your skin in any way. For it to work on acne the product needs to be used continuously for longer period. I have used it for 4-5 times and find it good. It is suitable for acne prone, dry as well as oily skin types. The best part is it is free from chemicals, artificial fragrance. It is dermatologically tested & made using the finest natural ingredients. I wish ingredients & quantity were also mentioned on the bottle. So my personal rating for this product is: 4/5.